Ross-on-Wye and across the country. "Hi Ian, Further to our discussion just now - many thanks for understanding the situation so quickly and efficiently. Kind regards"
"Hello Ian, Thank you for the very comprehensive - and comprehensible - survey report. There was very little in it that I did not expect to see, except for the extent of the damp ... Thanks again." 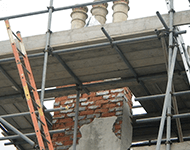 Providing a full range of building surveying services to owners and occupiers of residential, commercial and industrial premises in and around Ross-on-Wye, the Right Surveyors fundamentally understand that each client has different budgetary and unique property requirements.